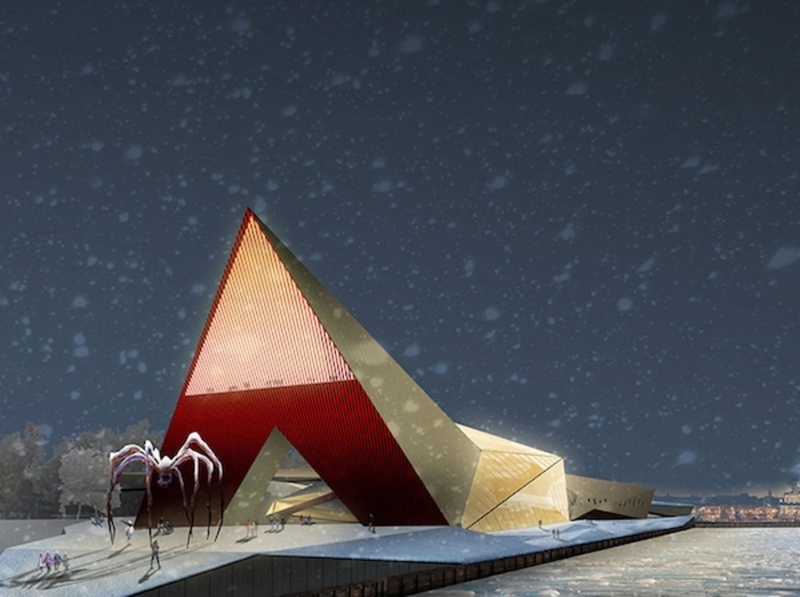 Screenshot from the Guggenheim Helsinki Design Competition. LISTS. It is hard to imagine architecture not getting its regular fix. The announcement of competition longlists, shortlists, and final lists pace the field’s collective conversation in a way that individual building projects or even group exhibitions usually do not. And if the playing field is not always leveled—too often, high-profile invited competitions read like Who’s Who lists—the site and the project size are at least common enough to make quick correlations and easily measure-up the contestants. So this past June when the Solomon R. Guggenheim Foundation announced that the two-stage design competition for a proposed museum on Helsinki’s South Harbor would be open to any qualified architect worldwide, they were ensuring a full year of tallying and intrigue. Entries would be due in September; submissions revealed in October; six entries selected by an eleven-member jury in December; a winner declared in June 2015. As to which, or how many, architects would enter was anyone’s guess. Open competitions for major museum projects are extremely rare, and altogether unprecedented for the Guggenheim. The brand has a Midas touch when it comes to buildings, but the every one of its iconic art containers—in Venice, New York, Bilbao, and Abu Dhabi—resulted from either a direct commission or an invited competition. All those designs also pre-date the 2008 global financial crisis, which has called into question such name-brand architectural glitter, along with the rarified processes that typically produce it. In Helsinki, skepticism abounds. The city board voted in 2012 to reject the proposal, citing lack of open debate about the project and doubts about the museum-as-tourist-engine economics that supposedly justified it. Last year, the Guggenheim and its local backers succeeded in moving forward by ensuring more public engagement and greater transparency. We knew to expect a bigger, more democratic competition, but no one could have anticipated just how weird and benumbing the whole process would get. The deluge began with a click. It was October 22, a Wednesday, and I had woken up to an email from a friend. The cryptic subject line: How to separate the sheep from the goats? The message: www.designguggenheimhelsinki.org/stageonegallery/view. At the tap of my mouse, the site launched and images loaded. Not all at once but rather one by one, left to right, row after row. Square, predominantly blue, they marched across my MacBook screen. When I scrolled, the gapless grid spawned more squares. Wooziness ensued. The sight of so many similar-but-not images—digital renderings of buildings of varied design on the same waterfront site, often depicted from identical perspectives—was crossing wires between my eyes and my brain. All 1,715 submissions were posted that morning, and fatigue had already set in. I have spent hours on the site since then. So I say with confidence that I have not seen at least a third of the proposed projects at a scale bigger than their gallery thumbnail (which truly are the size of an adult’s big-thumb nail when viewed on a laptop and a toddler’s pinkie on a smartphone). At an average rate of 30 seconds per submission—each consists of two images and a brief text of uniform dimensions and word length—it would take over fourteen hours to view them all. And, at any rate, prescription attention enhancers. The same technologies that had enabled this apparently fathomless pit had rendered my mind incapable of approaching its depths. If you are okay having no real say in the outcome of the competition, if a jumbo dose of architectural renderings of slick swirling surfaces and gimmicky lighting effects does not make you queasy and/or hugely dispirited, then the gallery does inspire some kind of ludic and social and participatory behavior—maybe. In effect, the Guggenheim had transformed the entire competition pool into a content mill, and was now relying on us to mine it. The interface’s “My Shortlist” feature allows you to play juror by compiling personalized six-entry shortlists that can then be pitched effortlessly into Facebook and Twitter streams, circulated. Ad-hoc lists were popping up elsewhere on the web too. At some point in the days after the Guggenheim released the competition entries, the popular real-estate blog Curbed published a post headlined “The 36 Weirdest Proposals for the Guggenheim Helsinki.” It was a quintessential “listicle”—the article-as-list form popularized by BuzzFeed—with a compelling combination of eye-catching cardinal number, zany adjective, and recognizable proper noun to generate links, likes, clicks, mentions, tweets, and, ultimately, site traffic. And to much success: the post now ranks—in the US, on my browser—second in a Google search for “Guggenheim Helsinki,” right below the official website for the competition. Weird was trending. Meanwhile, conventional indicators of achievement were nowhere in sight. If this was a competition, why wasn’t anyone talking about the “best”? Where were debates about the prowess of one submission, the weakness of another? Had we grown that contemptuous of considered judgments? The Internet has no winner’s platform. If anyone comes out ahead, it’s those who reach farther rather than stand higher. Buzz—not best—is the name of the game, the logic of our networked social media. Its means are its ends: magnitude of connectivity and velocity of circulation, reach and influence. Images, itinerant and mobile, are its privileged agent. What, then, becomes of things as stubbornly immobile and site specific as buildings? For some time now, designers and patrons of so-called signature architecture have responded to this question with icons or image-buildings whose obligations are awkwardly torn between their real and virtual sites. But with the changes in our visual economies and image consumption brought about by expansion of social media and smartphone use over the past decade, the production of architectural icons would inevitably need recalibration. Maybe we were looking at one attempt to adapt. By embedding the entries in the media environment that gives value to and conditions images today—cat GIFs and blue-chip edifices alike—the Guggenheim has transformed the design competition into a kind of proving ground—or screen test. Whereas architectural renderings once helped jurors and the general public bridge the representational gap between speculative proposal and real site, they serve here not as mediators but as the things themselves, media objects whose performance is evaluated within their virtual environment. Perhaps this is why, despite the 4:3 aspect ratio elsewhere on the site, the images in the thumbnail gallery are cropped into squares, simulating the familiar Instagram format that will give the project life blood when, or if, it is ever completed. And perhaps this is also why so many of the submissions are rendered with those artificial filters and faux-glow light effects. After all, it’s not the best project that the jury will be selecting. It’s the one that can buzz the most.